Heat oven to 325°F. Grease shallow 3-quart casserole with shortening or spray with cooking spray. In 3-quart saucepan, heat whipping cream and half-and-half to boiling over medium-high heat, stirring constantly. Stir in baking bar pieces; remove from heat. In large bowl, beat sugar, egg yolks, vanilla and salt with electric mixer on medium speed until creamy. Gradually add cream mixture, beating constantly, until smooth. Line bottom and side of casserole with some of the baguette slices. Pour 2 cups of the cream mixture over bread. Let stand a few minutes until bread absorbs mixture. Add remaining baguette slices. Pour remaining cream mixture, 2 cups at a time, over bread; let stand a few minutes until bread absorbs mixture. Place casserole in roasting pan; place in oven. Pour boiling water into roasting pan until 1 inch deep. Bake uncovered 45 minutes. Cover with foil and bake about 1 hour 5 minutes longer or until knife inserted 1 inch from edge comes out clean. Place raspberries in blender. Cover and blend on high speed until smooth; strain seeds. 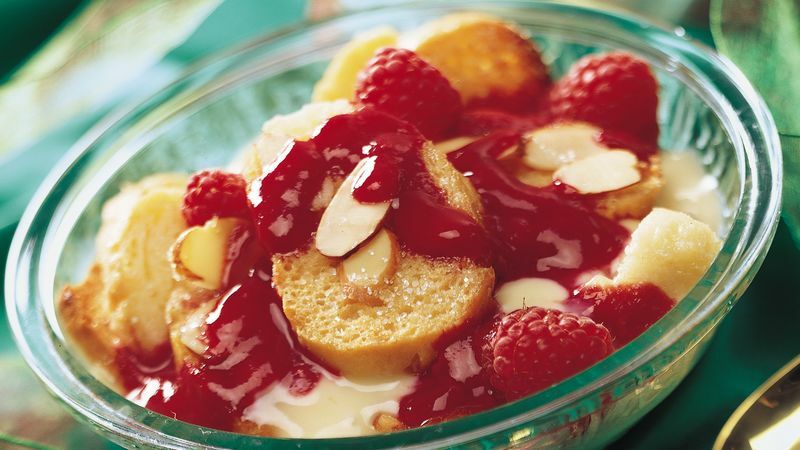 Serve warm bread pudding with raspberry sauce and, if desired, fresh raspberries. Serve this cozy pudding spooned into holiday mugs. Add a scoop of vanilla ice cream to each serving before drizzling with raspberry sauce.